Nikolai Kapustin's Sonata for flute and piano, op 125, was composed in 2004 at the request of Immanuel Davis, flute professor at the University of Minnesota. The work is in four movements, and both flautist and pianist are occupied, jointly and individually, in performing a piece that requires a considerable level of technique as well as a thorough grasp of Kapustin's jazz idioms. Watch a lovely, fluent performance of the flute sonata played by Akane Otsuka, accompanied by Masahiro Kawakami. 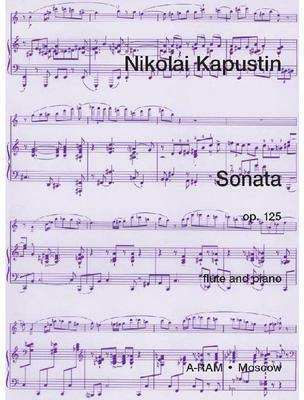 Contact us if you'd like to be notified when Flute Sonata op 125 by Nikolai Kapustin is next available. What do you want to know about Flute Sonata op 125 by Nikolai Kapustin?